I received the second book in this series from Net Galley to review, but I hadn't read this one yet, and I don't read out of order! So I put this one right to the top of my list, and I'm so glad I did! I like the cover well enough. I actually don't think it does the story justice, to be honest. There is so much that could be done with the theme of the book. The color is beautiful, but I just don't get a sense of what the story is about at all. And even after having read the book, the cover doesn't make much sense to me. But it's still pretty, nonetheless. Kate, the main female character, really does strike me as an actual teenage girl. She is mourning the loss of her parents and you can totally feel that from her. I love how she grows through this book, really coming into herself, despite any fears she might face. And I love that she is so loyal to people, especially her boyfriend Aaron, despite the fact that she truly doesn't want to be with him anymore. She seems quite un-selfish and deeply cares for those she loves: her sisters, her grandparents, Aaron, Lee. She is strong and resilient, smart and quick. Aaron just annoyed me. He cares for Kate, but at the same time comes off as being totally selfish, while she is so unselfish when it comes to him. Lee is just an awesome best friend. She gives Kate the space she needs while still supporting her. She also helps her realize the direction she needs to go when Kate is confused. Jenna and Josie, Kate's younger twiin sisters, are definitely those annoying younger sisters. Yet Kate tolerates them so well. They are cute with their bickering. Grandma is sweet and protective. Grandpa, well, he just rocks. He is very supportive of Kate and really helps her to try and make the best choices she can. And Toni, well, I just loved him. I think by far he is my favorite. He is so funny and quick witted. There was not way not to like him. Every interaction he has leaves you wanting more. The other ancillary characters are nice. They are essential to the story in the way they help Patrick and Kate. There is not really a need for them to be more well developed at this point, unless they are going to be re-introduced in a major role in future books. The evil characters were hard to gauge. I didn't get much of a sense of them or what exactly they were about. I did see that they were just evil, and that was enough for this part of the series. I love the paranormal aspects of this story. I have not really read any stories with guardians and seers, so this was new for me. I like how they work together to get the "bad guys." And the plot was not compacted, so it was easy to follow. The pace of the story is nice. I found myself constantly wanting more and had a hard time putting it down when I had to do other things. There is just the right amount of action to sustain you until more happens. I like that it is not overpowering. I also loved how the author focused on growing the relationships between the characters. This seemed like such an important part of the story to me. The romance aspect of this story is very sweet. I love how Kate struggles with her feelings for Patrick, but really does understand what is right and what is not seeing as she has a boyfriend already. Again, they take their time getting to know one another and let their feelings for each other grow. One of the things that I disliked was how the author used POV in this book. It was not consistent. When the POV changed, it took me a bit to realize that it was a different character talking. I would have preferred more from Patrick's POV, as well. I'm not sure if we'll see that in the next book or not, but that would be nice. Perhaps chapter sub-headings would have helped me with this confusion. Certainly there is not necessarily the need to alternate each chapter with different POVs, but I just felt like that aspect of the story telling was lacking. I commend the author on her storytelling. The language of the book was very good and not confusing at all. It flowed well from one sentence to the next. She did not overuse words or make you feel like she was trying to use words just to "beef" the story up. The story did not need that, anyway. The writing of this book does not make me think it was Frost's debut novel. She has a wonderful command of the English language. I am looking forward to reading the next installment in this series! 4 out of 5 stars from me. 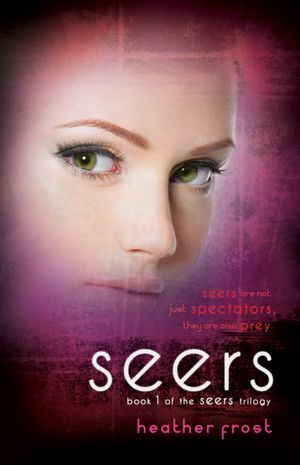 Sign into Goodreads to see if any of your friends have read Seers. 12.0% "This is SOOOO good! I could not put it down last night but had to b/c my eyes were closing!" 16.0% "I'm itching to know what's going on!!!" 25.0% "Ah...finally I know what Patrick is...."
31.0% "Ugh, had to stop in the middle of a chapter, I hate that!" 44.0% "I can't wait to see what happens!" 54.0% "Ugh, baby came in and I had to stop reading last night...blah!" 59.0% "OMGosh, I just LOVE Toni's character. He's so funny!" 72.0% "Ahhh....and there's the kidss..WOOT WOOT! I just LOVE Patrick...RAWR!" 92.0% "I really wanted to finish this last night but my eyelids wouldn't let me! ARGH! Love the story!!!!!"